« Bringing the kitchen out of the Dark Ages! Thank You! I’m going to try this next week, in my daughters home. wish me luck. 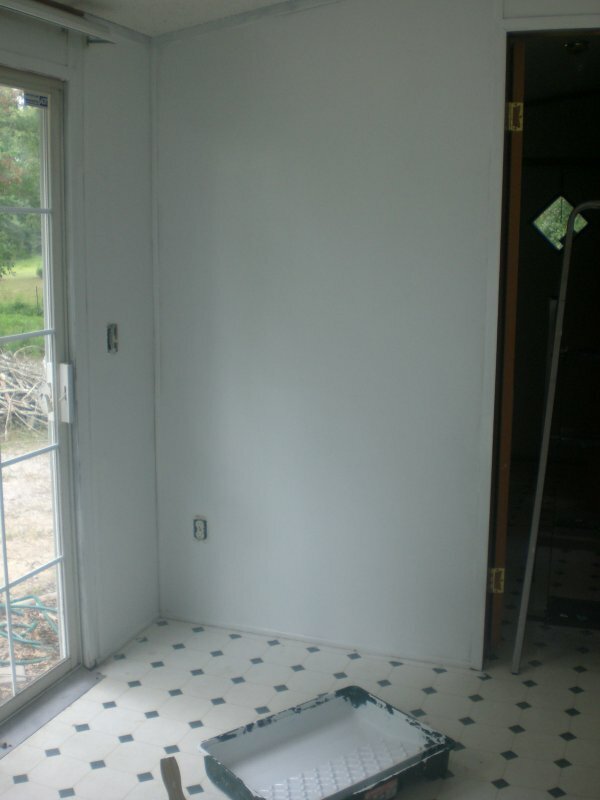 In my previous home I made the mistake of white vinyl tiles. I never had it before , didn’t realize how dirty it would look. After living there for eight years we replaced it. A year later we moved to our double wide home. 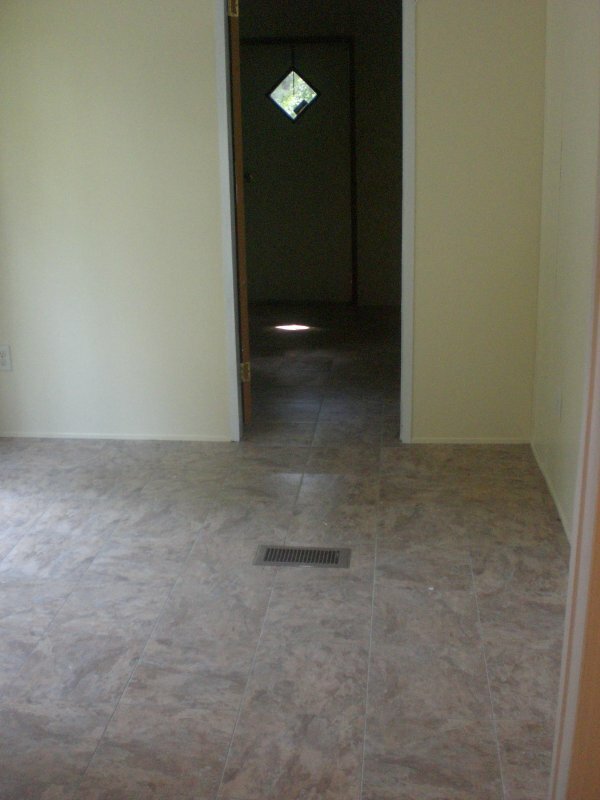 It had almost the exact same floor that we started with at our previous home LOL! 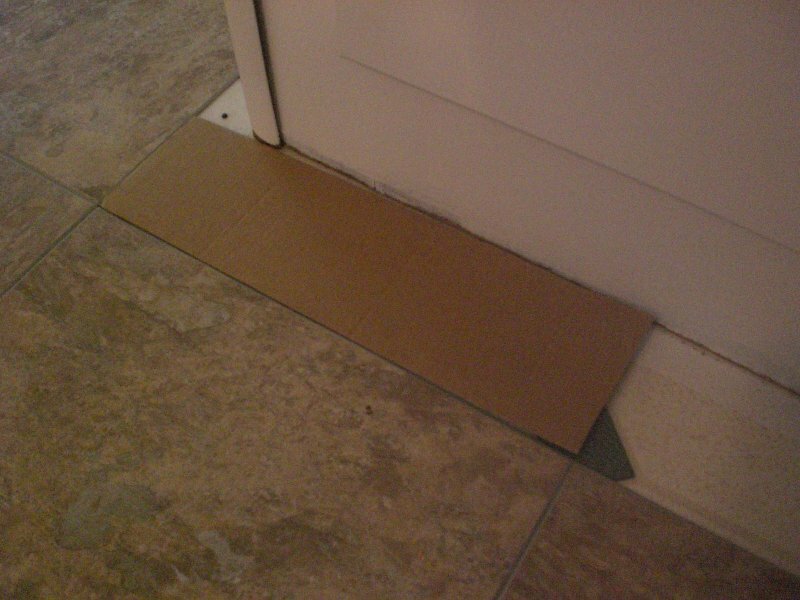 I knew I wanted to change the floor right away, but we haven’t been able to afford to do so. We will be replacing it soon…sometime in Nov. I cant wait! I understand the whole primer thing too. Our kitchen, bathrooms & laundry room all have the wallpaper that you need to prime in order to paint over it, so the paint will stick. 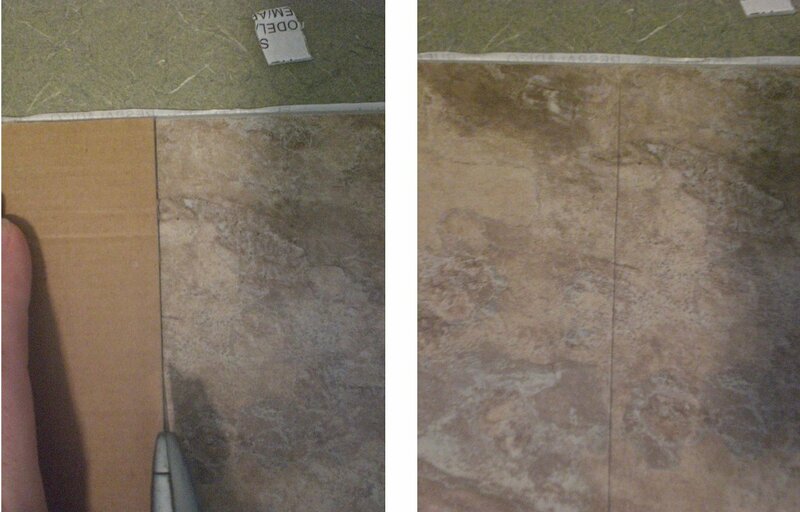 We went a step further and took all of the strips off the seams, mudded and taped them. Our house is slowly coming along but it’s starting to feel more like our home. What primer do you use? 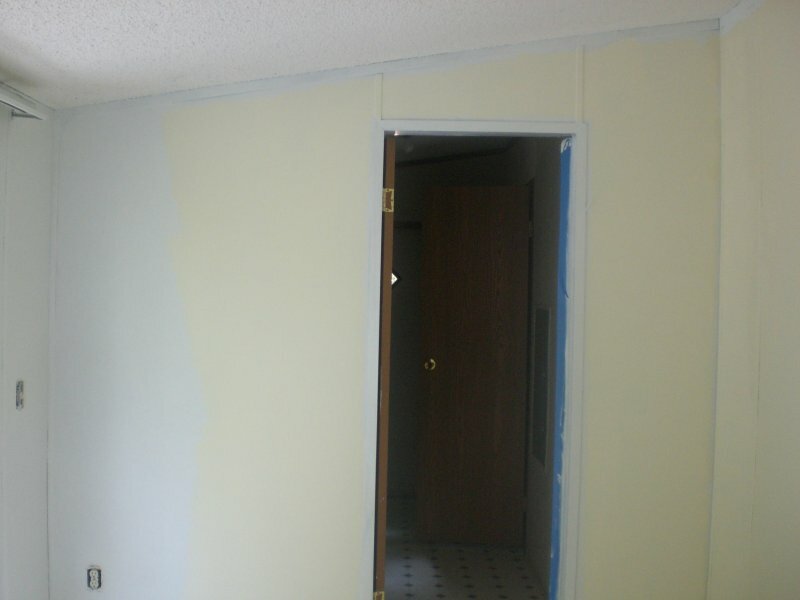 The first time I used the primer I was told to buy a really expensive primer…..over $30 a gallon. Then the second time I bought the Kiltz brand but it was really hard to work with because it was stinky & it was oil based. It was impossible to get the brushes clean. I was wondering if there was something better to use. 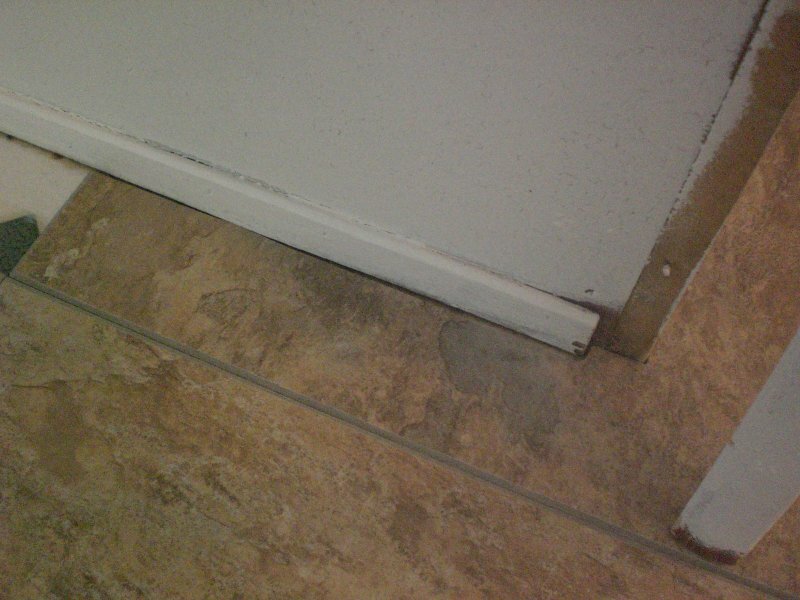 I noticed in the photos of your peel-n-stick tile that the pattern of the tiles were not all the same. 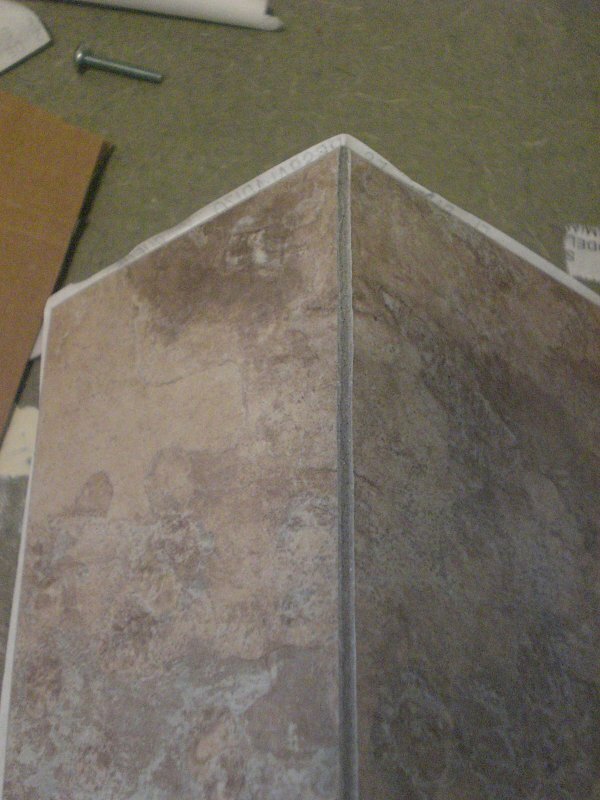 It appears that some of the tiles were turned in a different direction from some of the others. In my experience with peel & stick tiles, the peel-off papers have directional arrows on them so that you know which direction each tile should face, thereby resulting in uniform direction of the pattern. Just a little advise from an old handyman. 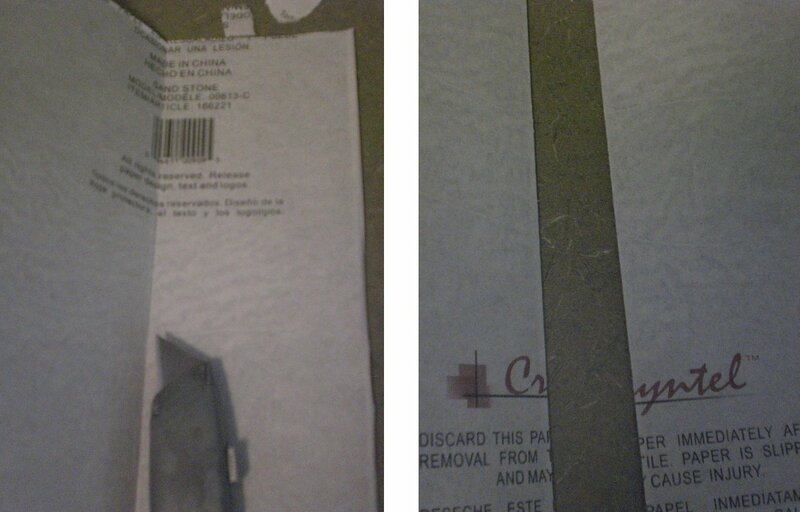 Follow the pattern direction of the arrows on the peel-off paper and you will do fine. Howdy! 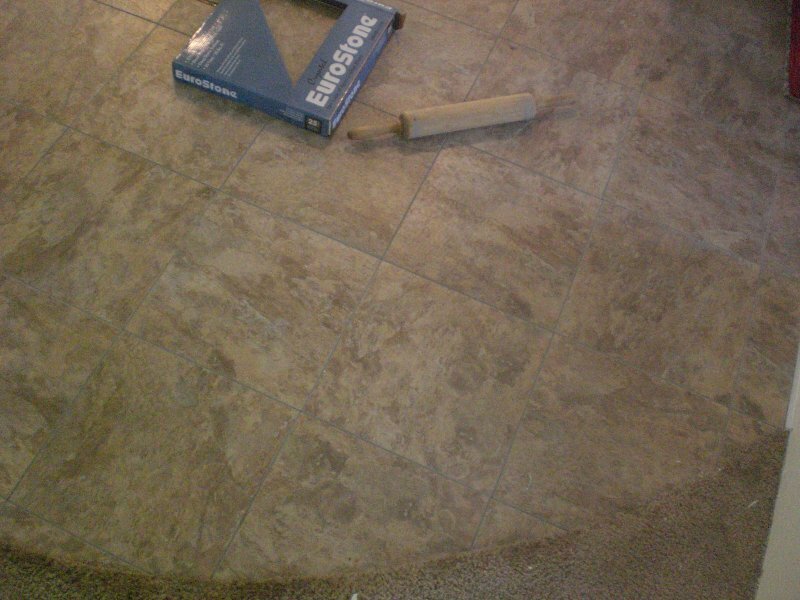 These tiles didn’t have directional arrows on the back, and the “stone” was a random pattern that looked good any which way you turned it — so we just put them down as they came out of the box. 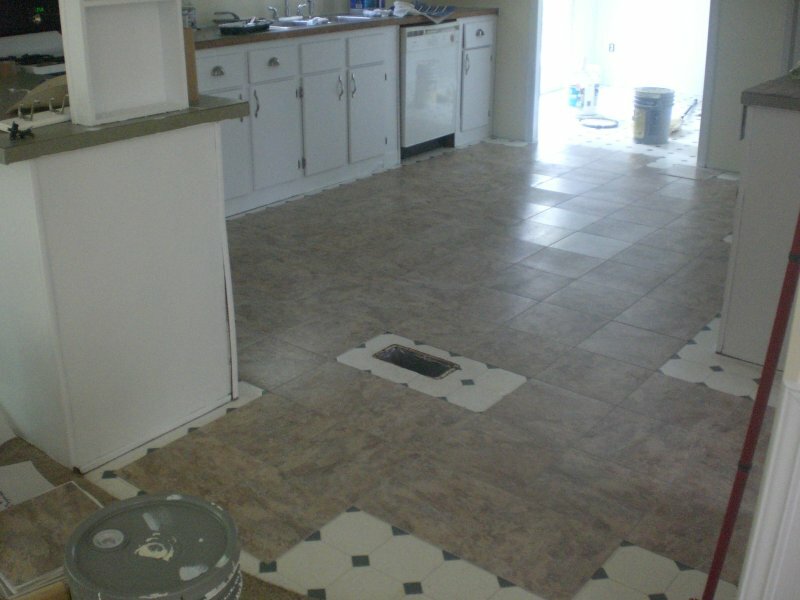 I’ve laid real tile before that had to be matched for pattern, and that is a pain in the neck! 😉 It’s neat that the sticky tile makers put arrows on tiles with patterns that have to be matched. That would be a real help. Thanks for stopping by! Hi there! 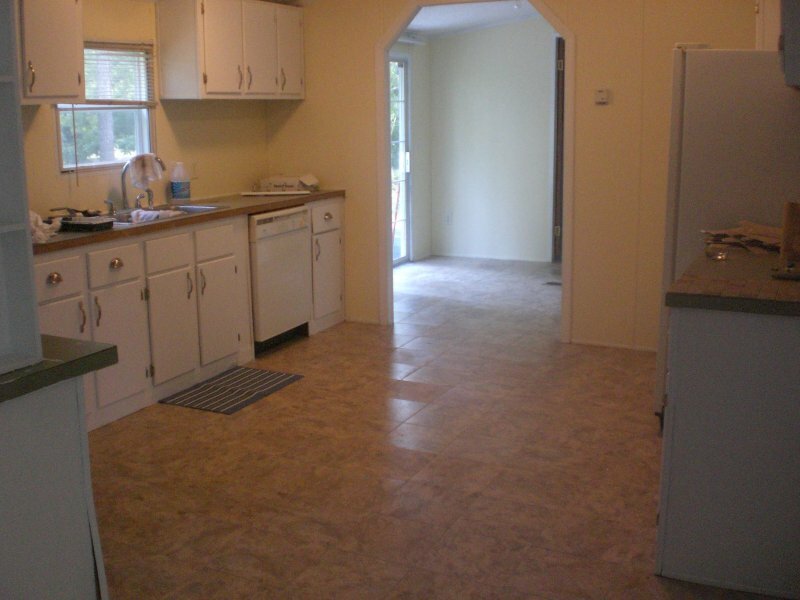 The floors absolutely stood up to the wear and tear our family can dish out. We did not have any tiles come up or even start to come unstuck. 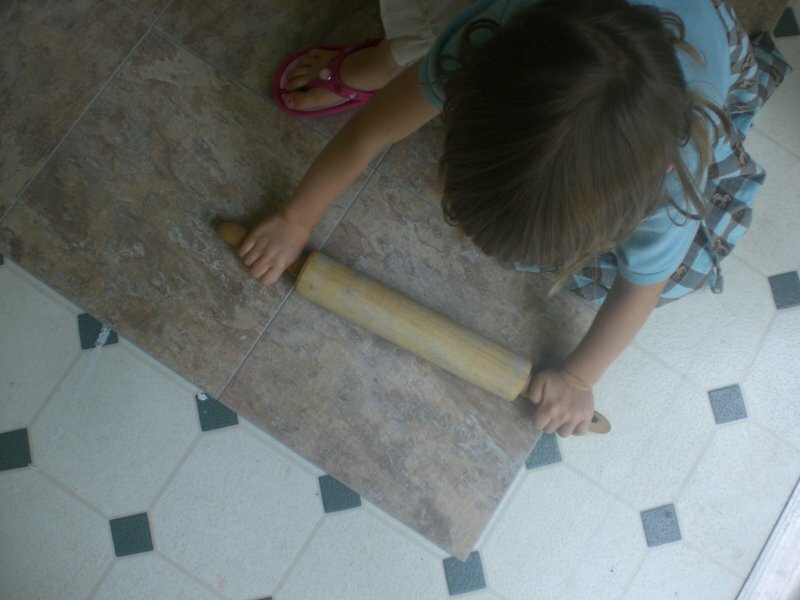 I think the key is prepping the floors (stripping the wax) and firmly rolling those sticky tiles down into place. 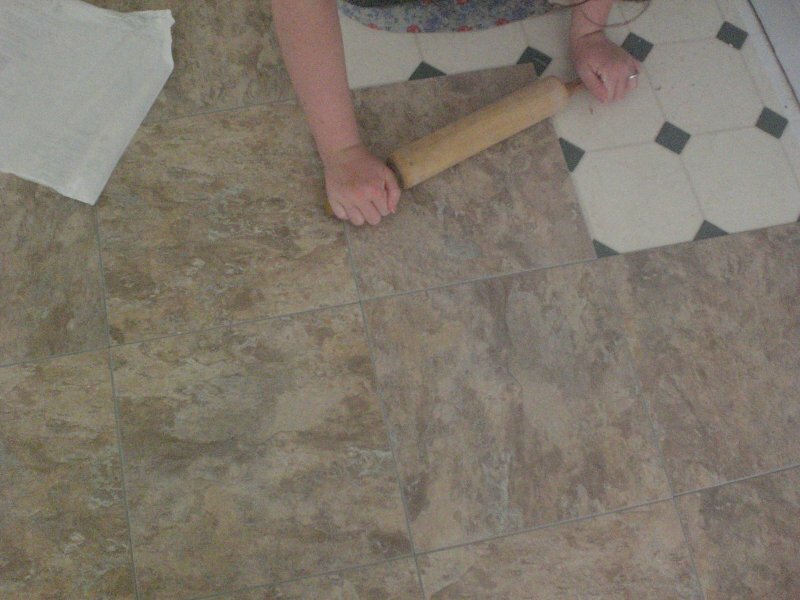 We would definitely do this again if we needed to update a kitchen floor. 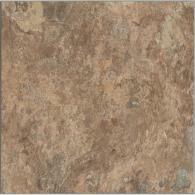 I laid the peel and stick armstrong tiles in my bathrooms after I had to have the floors replace due to a water leak. 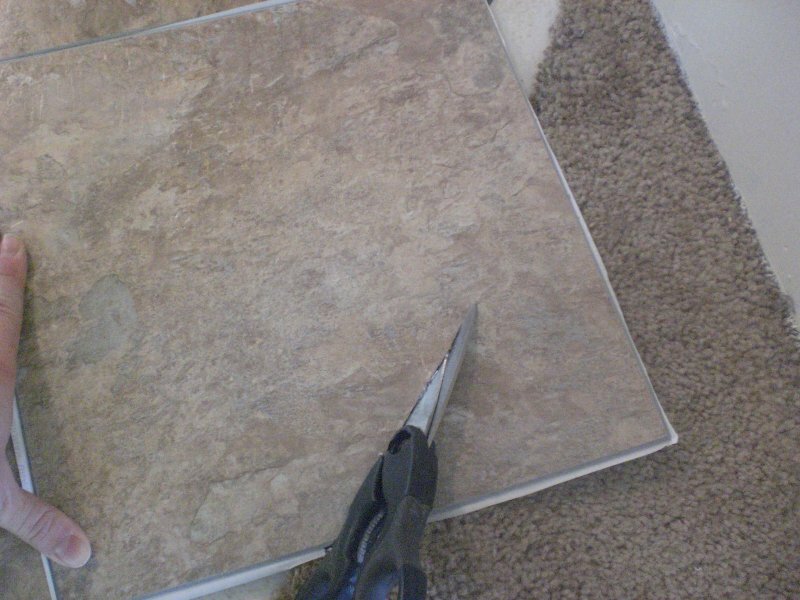 I put them down on the particle board we used as the subfloor. Well much to my shagrin I didn’t read on the box that you can’t put them down on particle board. It states that you have to put them down on a smooth surface. I had a few that slid on me. 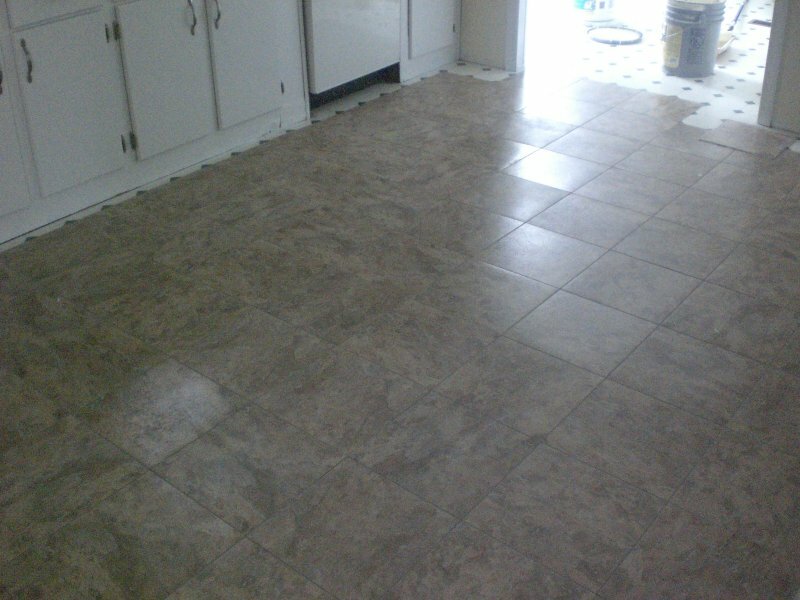 I replaced them with new tiles and used your tip for rolling the floor tiles. 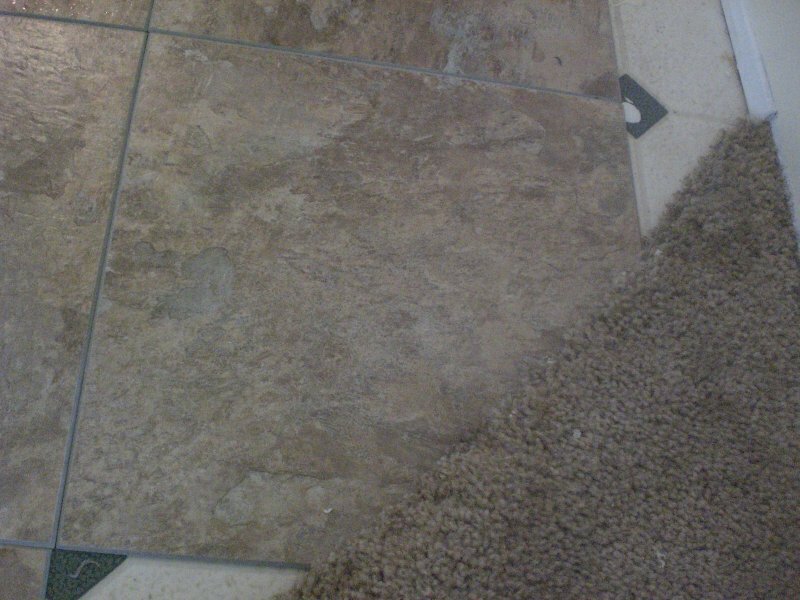 I had a few that wouldnt come up so I just found some sanded caulk that matched the grout color on the tile and flilled in the gaps. I have a pretty floor that is now waterproof and I love it. Thanks for the tip. That’s wonderful, Lisa! 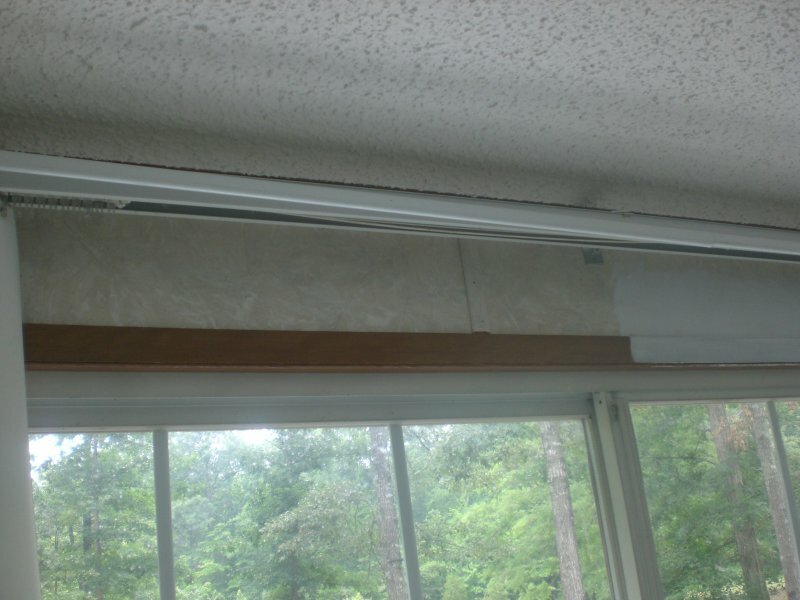 I should have mentioned that about particle board in my post, but I clean forgot. 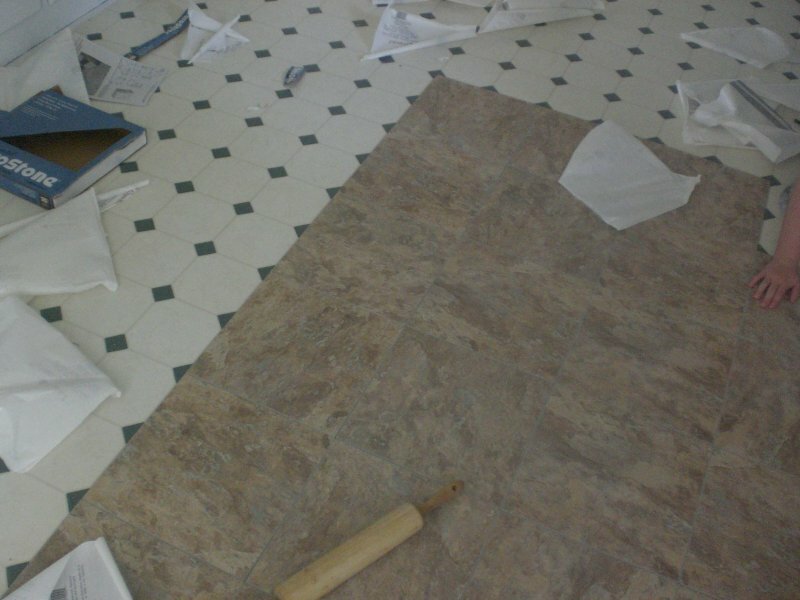 I initially thought of pulling up all the old linoleum to set the tiles, then read about how they wouldn’t stick to particle board or rough plywood, so I just stripped that linoleum and went straight over it. 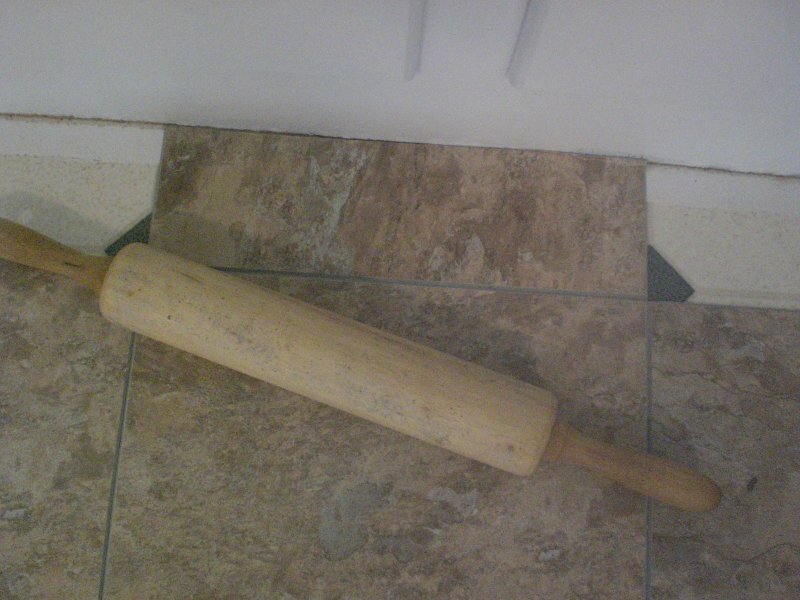 Sounds like you got a beautiful floor!